Who choose the Canary Island La Palma as a holiday destination, has many ways of arrival. 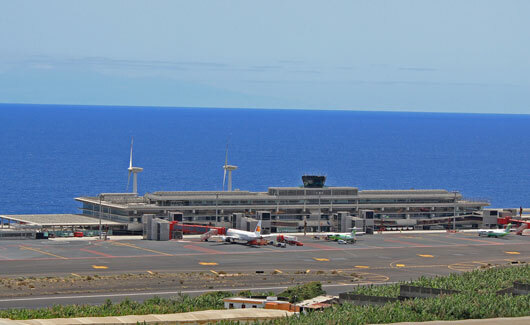 Of course the direct flights with destination Airport Santa Cruz de La Palma (SPC) is the first choice, which can be found in the actual summer and winter schedules of La Palma 24 - click here. The final stage of the trip to La Palma is always the trip from the airport to your holiday home. The airport is located eight kilometers south of the island&apos;s capital Santa Cruz on the east side of the island. Package travelers will be picked up by buses of the tour operators. Also holidaymakers who have booked a car with a car rental company such as La Palma24 rent a car will have a convenient final stage. Just turn after the luggage pick to the left and follow the signs "Parking" until you get to the elevators and escalators. Embark by elevator or escalator to the level -3, parking deck S-2. When you reach the parking deck, turn left into the area A. At the airport car park waits our staff and do the paperwork quickly and efficiently. Do not forget your driving license! The rental car will be handed over – upon departure just drop of the car at the airport. Furthermore buses bring tourists to their destination. The busses on La Palma are named Gua Gua and starting from 7 am until 6 pm every half hour, afterwards until 21:15 pm every hour from the airport to the island&apos;s capital Santa Cruz. There you change for the bus to your final destination bus. Holidaymakers who want to use the bus during their vacation can purchase a so-called Bono ticket. You will get detailed information about these prepaid tickets at the bus station in Los Llanos. Of course at the airport also are waiting taxis for travelers. You have to pay a little more than one Euro basic fee and 80 to 90 cents per kilometer for a single journey. You also can deal with the taxi driver regarding the costs for one round trip. In other words: calculating is required – a rental car can be cheaper for longer trips! You pay for example for a taxi ride from the airport to Puerto Naos in the west of the island currently between 40 and 45 Euros. Package travelers are welcomed in the terminal by their tour guides. There is also a tourist office, a first aid station, a pharmacy, a lost property office and various shops, a snack bar and children&apos;s areas. Important tip: Do not travel without cash. Reason: Not all places on La Palma are equipped with ATMs - and even if, they are not always filled. Banks only exist in the cities and in some larger towns. There are many ways of arrival on the Canary Island La Palma. They change from time to time or there are new ones, that`s why we describe them always actual in our La Palma 24-Journal - click here.